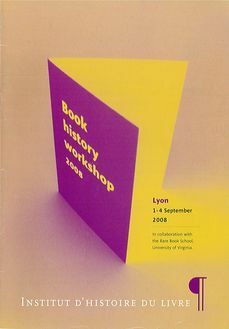 The Book History Workshop, organised by the Institut d'histoire du livre, is the European offshoot of the Rare Book School, universally recognised by specialists in the field of book history. Founded by Terry Belanger at Columbia University, RBS is now run at the University of Virginia, Charlottesville. A second offshoot of RBS has also been established in New Zealand. The philosophy of the Book History Workshop is to perpetuate and develop skills and practical knowledge in the field of book history. Courses are based on intensive contact with internationally recognised specialists in specific fields, using printed and audiovisual documents with "hands-on" sessions with original documents of all periods from the rare book collections of Lyon's City Library and Printing Museum. An important aspect of the Book History Workshop is its transversality for in bringing together a wide range of professionals it encourages exchanges among the many fields which contribute to the development of book history. Ce cours offre une introduction à l’étude des manuscrits en Europe de l’Ouest, spécialement en France. Ce cours propose une discussion critique des méthodes et techniques utilisées par les incunabulistes. Ce cours traite la période qui débute avec l’industrialisation de l’imprimerie et des métiers qui lui sont liés et les effets visuels qui en découlaient dans les domaines de la typographie, de la publicité et du graphisme de l’information. Longtemps négligés des chercheurs et des bibliothécaires, les imprimés éphémères soulèvent de nombreux problèmes de définition, de conservation et d'exploitation.